Revelations this summer about Enron Energy Services' byzantine electricity-trading practices have fueled charges that merchant power producers and traders artificially engineered the California electricity crisis of 2000-01. A careful examination of the suspect trading practices, however, reveals that there's less to those charges than meets the eye. The trading strategies in question all involved the pursuit of arbitrage opportunities, which arise when price discrepancies exist for a commodity in different locations or time periods. Exploiting arbitrage opportunities generally enhances economic efficiency by ensuring that electricity is reallocated where it is needed most. While some of the arbitrage opportunities were artificially manufactured by the companies themselves (in ways that may or may not have violated the law), most of them arose as a natural consequence of the market structure imposed by the California political system. In any case, it's unclear whether the trading strategies in question actually served to increase prices on balance. Even economists who are convinced that they did contribute to the increase in electricity prices attribute only about 5 percent of the alleged overcharges to the strategies at issue. Most of the price spike of 2000-01 is explained by drought, increased natural gas prices, the escalating cost of nitrogen oxide emissions credits, increases in consumer demand stemming from a hot summer and then a cold winter, and retail price controls that prevented market signals from disciplining producers or consumers. The price collapse in the summer of 2001 stemmed from a reversal of those conditions, not the imposition of federal price controls or the elimination of the trading practices in question. Copyright 2002 The Cato Institute. All rights reserved. 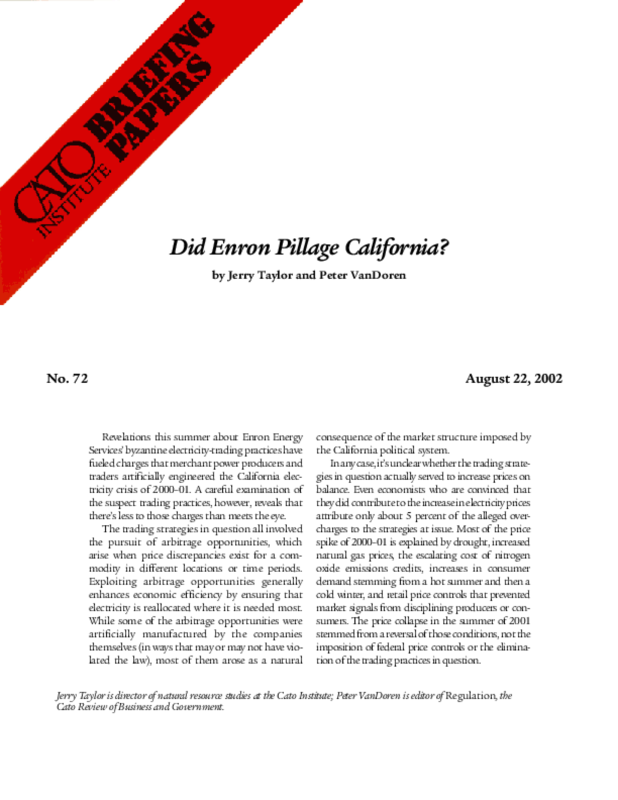 Title: Did Enron Pillage California?